This is certainly a picture of me in my happy place. 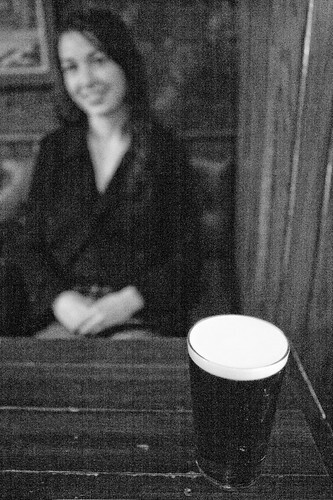 I was in Edinburgh, I had a new bride sitting opposite me & a pint of Guinness sitting in front of me. Can a man ask for more? College. That was another happy place for me too. Right about now, everyone is going back to SMBC & jumping into the study. It turns out that life here on the Central Coast is pretty good. The congregation here is incredibly friendly, the teaching is sound, my boss is great, and I think there is almost unlimited potential when it comes to my job here. It all feels a little overwhelming, but that is OK.
Our house is also pretty nice. The good thing about living in a Townhouse as opposed to an apartment is that we really feel like there are different spaces. My study is a legitimately separate area, so Shona is free to watch TV & not feel like she is bothering me. Even better, I have my whole library together for the first time in years. Rest assured there will be pictures of the house coming very soon. Anyway, I think I might be changing the tack of this blog in the near future. Maybe making it more about reflections on my time here, the stuff I am doing & the stuff I am reading. I’ll have a think about confidentiality, about how much grovelling I will have to do to the always-generous Chris to help me give things a new look, then work out what is going to happen with photos & the like. This might also give me more to write about on the blog, since I have really slackened off in the last 6 months or so. Of course, when we get the internet at home, that will make a huge difference too. Who knows when that will be though. In the mean time, Wyoming is a happy place. Here’s hoping it continues to be so. Oh, I thought I would steal a leaf out of Veltmeyer’s book & make this a prayer point blog for those who pray too. Here’s a couple to start with. Shona: Pray that she might be able to find work for the couple of spare days that she currently has. Tim: Pray that I could learn people’s names as quickly as possible & that I could find a good rhythm with all the different tasks in my calendar. Will definitely pray for those things. Have you found any good bottlos in Wyoming yet? Looking forward to seeing you guys soon.